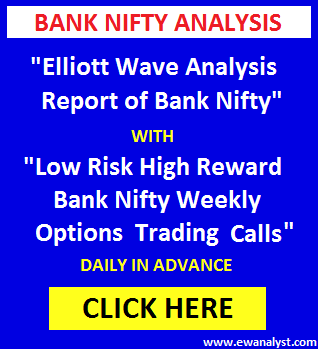 Bank Nifty opened higher at 29920, bounced further to register fresh new all time high 30008 but didn’t sustain at higher level and declined back again by more than 450 points to register low 29508 and finally closed 249 points down at 29582. Friday, 28789 was immediate downside breakeven point and Bank Nifty was expected to bounce further towards 29885-30070 without breaking lower below 29789. But 30070 was a good resistance from where a small or big correction was expected without breaking higher above 30070. No particular trade was suggested but mentioned conditions that “Intraday buying can be done near 29789 for targets range 29885-30070” OR “Low risk selling can be done either near 30070 or after trading below 29789 for 15 minutes” and Stoploss for the trade should not be more than 83 points in any case. 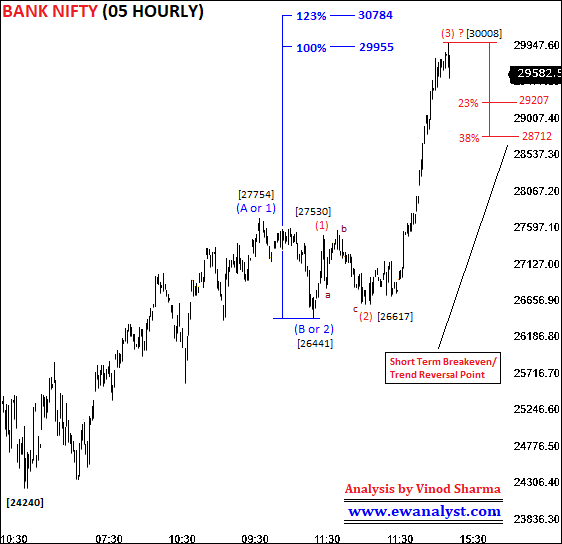 Bank Nifty registered high 30008 and declined by almost 500 points from day’s high. Now, we need to analyze fresh charts to calculate further move. This is 05 Hourly time bar chart of Bank Nifty covering move from low 24240. It seems wave completed from 24240-27754 may be wave (A or 1), wave completed from 27754-26441 may be wave (B or 2) and wave (C or 3) may be in progress from 26441. 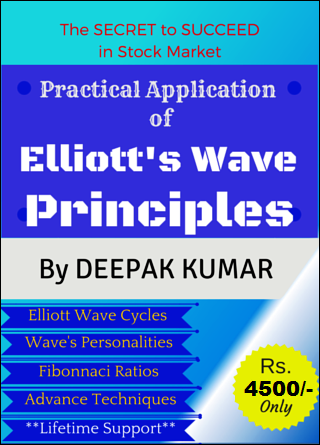 100%-123% projection for wave (C or 3) is placed at 29955-30784 which is the normal range for completion of wave (c or 3). 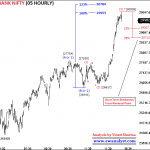 Bank Nifty achieved 30008 till now. 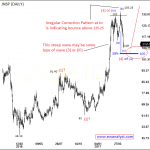 Within wave (C or 3), it seems wave completed at 27530 may be wave (1), wave (2) may be completed at 26617 as Irregular Correction and wave (3) may be completed at 30008 or still in progress. 23%-38% retracement for progress of wave (3) is placed at 29207-28712 which is the support range and same 28712 is the short term downside breakeven point and we can think of any bigger reversal after breaking below 28712 only. Now, let’s analyze the decline started from all time high 30008 on separate lowest time frame chart to check next immediate move. 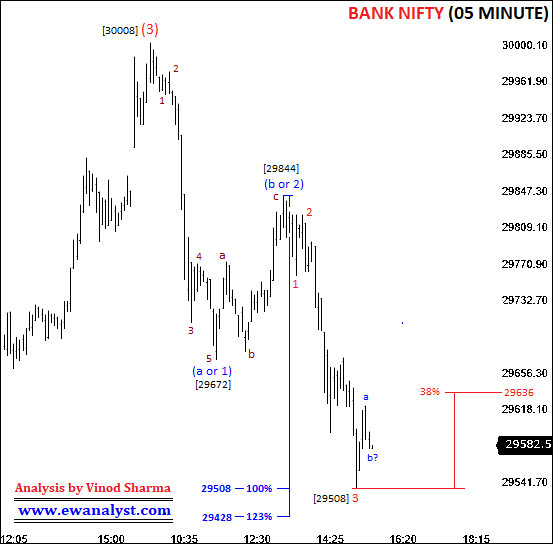 This is 05 Minute time bar chart of Bank Nifty covering move high 30008. It seems wave (a or 1) may be completed at 29672, wave (b or 2) may be completed at 29844 and wave (c or 3) may be in progress from 29844. 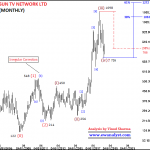 100%-123% projection for wave (c or 3) is placed at 29508-29428 which is the normal range for completion of wave (c or 3). 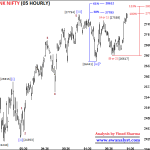 Within wave (c or 3), it seems wave 1,2,3 may be completed till 29508 and wave 4 may be completed at 29623 or still in progress. 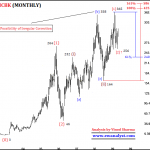 38% retracement of progress of wave (c or 3) is placed at 29636 which is the immediate upside breakeven point. 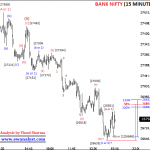 Bank Nifty if breaks and stay above 29636 by more than 15 minute can result in further bounce towards 29844. 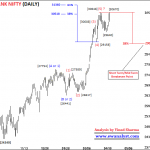 Bank Nifty still in positive zone in short term as long as trading above short term breakeven point 28712. Any bigger downward reversal we can expect after breaking below 28712 only. For Intraday/very short term, Bank Nifty can decline further below 29508 as long as trading below immediate upside breakeven point 29636. 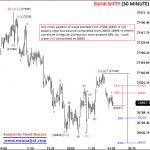 But Bank Nifty if breaks and stay above 29636 for 15 minutes can result in further bounce towards 29844. Overall, Bank Nifty is still in bullish zone and possibility with 29207-28712 but we need to wait for decline towards this support range to decide any positional trade. For Intraday, Bank Nifty if breaks and stay above 29636 for 15 minutes then any later decline towards 29600-29550 can be used for intraday buying with stoploss of 29499 expecting bounce towards 29844-30000. Premium of options are very high, so it is safe to trade in Bank Nifty Futures in minimum quantity with strict stoploss. Otherwise Traders who want to trade in options can buy suitable Call/Puts according to the conditions.